As we enter into a new relationship, we tend to find ourselves under a spell called infatuation. Your significant other appears to be perfect, says and does all the “right” things, you can’t get enough of each other, and you feel head over heels in love. While this phase of love can often be the most exciting and memorable part of a relationship, the red flags may begin to appear. Sometimes the infatuation feels so intense, however, that many people tend to overlook and become blind to the red flags they see from their partner. Red flags differ for everyone, but some common “red flags” include clingy behavior (frequent texting, wanting to see you, insecurities, trust issues), avoidant behavior (falling off the grid for a couple days, no replies, fear of commitment), or differences in values (children, marriage, career, etc). While you may be able to work through some of these red flags in your relationship, it is important to make sure it is a good match for you. Below are a few things you can do so that you can recognize red flags in your future relationships and respond accordingly. 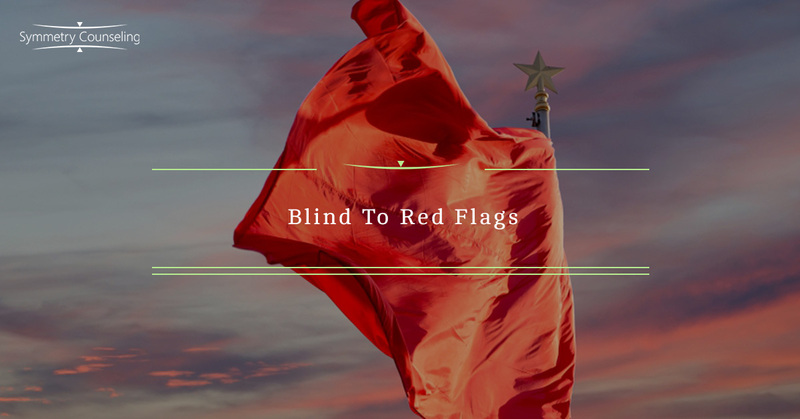 In order to recognize red flags, it is important that you know what yours are. To do this you must take some time to reflect on previous relationships that worked, hurt you, and ended. Doing so will help you identify trends of who you have been attracted to in the past and compare them to what you are looking for today. For example, you may have been attracted to individuals who have a hard time committing to others. Moving forward you may want to watch out for behaviors such as not responding, ghosting, see other people, etc. Some good strategies for reflection include journaling and individual therapy. Once you have established what your red flags are you must look for them, even in a state of infatuation. Oftentimes, these red flags are things we have experienced before, therefore we tend to feel comforted by them rather than turned off. Make sure you become more mindful of seeing red flags and recognizing them in the moment. Imagine a scenario where you notice your partner gets angry when you go out with friends. Rather than brushing it off, mark it down as a red flag you noticed. It may get better, however, it is something to pay attention to. When you recognize a red flag in a new relationship it is important to evaluate what it means to you. Is this red flag a dealbreaker? Is it something you want to explore? Is it part of a maladaptive relationship pattern? Make sure you are at least reflecting on what the red flag means to you. As long as you are seeing and evaluating red flags, you are already doing a lot for you and your potential relationship. If you are finding it difficult to see red flags in relationships and would like some support, it may be useful to connect with a therapist. Contact Symmetry Counseling at 312-578-9990 to set up an appointment with one of our very skilled therapists today!